As your premier tower painting contractor, we send our highly skilled and experienced team members to your site. If you look up at your city’s water tower and wish the colors were more vibrant, or if you have some metal towers that need to be more visible at night, it can be difficult to determine how to get your towers looking their best. 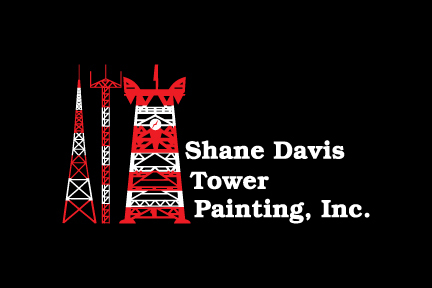 Whether you are in charge of maintenance for a small municipality or you have multiple radio and water towers that need attention as part of a metropolitan area, you can rely on us at Shane Davis Tower Painting to provide the services and solutions you require. With more than 35 years of experience as a trusted tower painting contractor all over the United States, we have the expertise to paint your radio and water towers to make them look their best. Whether you need to get rid of rust and weather-worn paint materials or are looking for a quick update to the colors for an improved aesthetic, you can trust us to take care of the painting of your water and radio towers with efficiency and precision. Spray Painting – We use high-quality spray paint as the primary method of painting your towers, so the result is aesthetically pleasing and long-lasting. As your tower painting contractor, we send our highly-skilled and experienced team members to your site, and they will complete the job just like we discussed during our initial consultation. Sand Blasting & Rust Removal – Sometimes your towers haven’t had attention in quite some time, and it may seem impossible to get them back in shape. Long-term exposure to the elements can affect not just the paint, but also the metal underneath. At Shane Davis Tower Painting, we have the tools to sandblast and remove rust prior to painting, so you will see a smooth finish and improved overall appearance. This will also help protect your towers for many more years to come. Lead Paint Containment – We know now that lead paint can cause issues that weren’t previously acknowledged. Lead paint is notorious for peeling and cracking over time, and not only poses a health hazard, but can also quickly become an eyesore. If your radio and water towers were previously painted using lead-based paint, we can help to contain this hazard and add new paint products to improve the aesthetic and safety of your towers. Don’t call another tower painting contractor who doesn’t have the experience and expertise you need. At Shane Davis Tower Painting, our team is your first-choice because we service local and remote areas throughout the country, have the skills and equipment needed for any job, and will work with you to achieve your goals. Let us know how we can make your landmarks look better and create a beautiful backdrop for your city or town landscape. Getting started is as easy as picking up the phone, where we can discuss your tower painting requirements and provide a free consultation and quote. Contact us today when you need a tower painting contractor. We look forward to hearing from you.